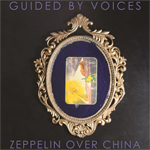 Original Release Notes: Zeppelin Over China is a major and majestic work in the GBV canon, spotlighting the scope and genius of Pollard's songwriting. With 32 songs in 75 minutes, the massive Zeppelin reaches lofty heights on its musical journey. Pollard continues to deliver endless invention and emotional wallop in 2 and 3-minute guitar rock gems. After well-deserved acclaim for the mind-boggling milestone of Pollard's 100 career albums, Zeppelin Over China is a wonderful entry point for new listeners to experience Guided By Voices for the first time. Not resting on his laurels, Pollard's tireless tenacity pays off with spectacular results. A "32 song Guided By Voices epic double album" was mentioned by Bob in a note posted to GuidedByVoices.com on July 11th, 2018.